The typical landscape in our region is dominated by the lawn. A lawn has its place in a xeric design as long as it is limited in size and is used to meet a particular function. Kentucky bluegrass is unequaled in its wearability, making it the grass of choice when it comes to high use areas, such as play spaces for children or pets. For many homes, providing some lawn space is entirely desirable and appropriate. A lawn need not be large, however, to be useful and attractive. The trick is to provide only enough lawn space to perform the needed function. Furthermore, a smaller, shapely lawn can be far more attractive than a large, homogenous bluegrass landscape. To achieve the optimum water conservation, bluegrass turf should be planted separate from other plantings so that it may be watered according to its own special needs. A zone of moderate water use plants surrounding the bluegrass turf area will make a good transition from high water use area to a low water use area. Moderate water use plants will benefit from any overspray from the lawn. Additionally, root systems will grow toward the turf zone and benefit from the higher soil moisture content. If wearability is not a large concern, there are a number of turf grass alternatives to a pure stand of Kentucky bluegrass that are equally attractive and far less thirsty. Many local seed suppliers specialize in creating blends of grasses that contain bluegrass, but balance the mix out with more drought-tolerant grasses such as brome, fescues, and rye grasses. 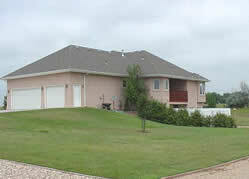 The large Buffalo Grass lawn surrounding this home is a good example of a water-thrifty, "alternative" lawn planting. Lawns established with these mixes handle traffic well and look nearly identical to bluegrass but can produce a water savings of 20% to 50%. Other grasses can save even more water. Buffalo grass, for example, is a native grass that can survive on as little as 5” or less of supplemental water per year, compared to bluegrass which needs as much as 25” of supplemental water per year. Buffalo grass is a warm-season grass that turns brown with the first frost of fall. It is a relatively short-growing grass reaching a height of around four inches, making it a desirable grass for those who desire a low-maintenance yard but still enjoy the colorful characteristics of having a lawn. 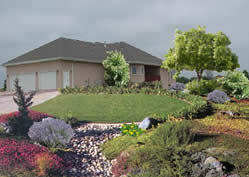 This simulation illustrates another water-thrifty lawn alternative that could have been constructed at the same yard. In this case, a smaller Bluegrass lawn is used as a lush welcome mat for the front door and is surrounded by a variety of colorful, drought-tolerant tress, shrubs and perennials. Avoid planting turf grass up to the foundation of a building. There is no need to water a foundation. Accurate watering of turf grass against a foundation can be difficult. Overspray can cause water damage to sidings, and water can cause damage to foundations. Instead, plant a minimum of a four foot wide bed for perennials and shrubs. Perennials and shrubs may be watered with drip irrigation, which is far more efficient and does not tend to wet more soil than is needed by the plants. Furthermore, perennials and shrubs can be used to soften the hard architectural lines and accentuate the architectural features through colors and textures.